New countertops are a great way to refresh your kitchen and add to value of your home. Plus, they are normally a critical part of any kitchen remodel or renovation project. 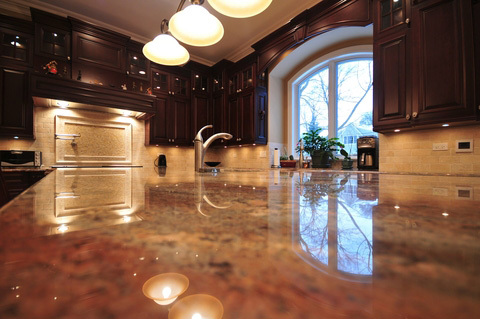 Before choosing your new countertop, however, you should ask three important questions. First, what is my budget and how much can I afford? You don’t want to reach the halfway point and discover you’re out of money! Secondly, what is the “look” I am trying to achieve? Finally (and if not remodeling the entire kitchen), what color and textures will complement the rest of my kitchen? Answer these questions and you are on your way to new kitchen countertops! As there are many choices available, we would like to provide an overview of the pros and cons of the most common countertops. In the first half of our “Choosing a Countertop” discussion, we’ll take a closer look at some of the more common surfaces. Then in the second half, we’ll discover some of the newer and/or more unique countertops that homeowners are enjoying! Granite countertops offer plenty of character through unique grain patterns. For endurance, however, sealing is the number one priority. Quartz, an engineered stone, is tough, nonporous, and eco-friendly. However, it’s not heat resistant so additional care must be taken to protect it from hot surfaces. Marble countertops are heat resistant and the mainstay of classic elegance. Just ask any pastry baker you know! Everyone loves their unique patterns that come in countless color tones. While beautiful, the relative soft surface will etch and scratch. Accordingly, nonabrasive cleaning products are required to protect the surface when cleaning. Laminate countertops are the surface of choice for budget-conscience homeowners. These materials are available in countless patterns and colors. Wood grains to glossy to marble-like looks are all available. Unfortunately, laminates are more susceptible to heat damage. Plus, they can take on an older, dull appearance as more scratches and dents occur. Butcher Block countertops go with nearly all styles. They are truly beautiful and add warmth to any kitchen. Importantly, Butcher Block countertops are easy on knives and other cutting utensils and your options are limited only by available hardwood species. As a natural wood product, surfaces can be damaged by sharp edges and hot items. Proper (and regular) sealing can limit this and other damage from water and chemicals. Likewise, sealing will prevent germs from residing on the porous wood surface. Tile countertops can offer homeowners a complete new look at an affordable price. Tile is durable and offers a wide array of selections that allow one’s creative sense to reign supreme in the kitchen. Unfortunately, keeping the grout clean may become a least favorite household chore. Likewise, rolling pie dough on a tiled surface will be a little more difficult. Stainless Steel countertops are the mainstay of commercial kitchens. Stain-resistant, easy to clean, durable, and long-lasting are all factors that make them worthy of consideration for your home, too. However, water spots, smudges, and fingerprints are hard to keep at bay. As you can see, there are many countertop options from which to choose. Next time, we’ll take a look at some other countertop materials, such as Solid Surface, Soapstone, and more!